Yellowstone Burners hasn't added a story. We are the newly formed Yellowstone Burners; a group of collaborative artists in Cody, Wyoming working together to create public art. 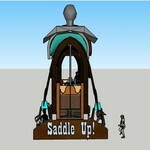 Our first project will be an art car designed to look like a 30 foot tall saddle resting on a saddle rack. The base vehicle is a bus and we will transform the interior into a high rolling, old west poker lounge. We will also have a viewing platform on top of the bus which will house The Watering Hole, an old west gunslingers saloon. While there may be many bars on playa, our saloon will serve...water. We will have a 50 gallon container of potable water on board each day and each night that we go out. Today, we need your help. We are excited to bring this mobile hydration station to the playa and will fill it with as many people as we can safely fit for rides around Black Rock City. We just need the initial funds to get this all started. You will be contributing not only to a great new art car in BRC but to the future of public art in Cody, Wyoming. We are grateful for every dollar that folks are able to contribute! If just 250 people gave us $100 each, we'd reach our goal! $25 a vinyl sticker with our Saddle Up! logo. $50 custom printed bandana with our Saddle Up! logo. $75 your picture on a wanted poster which will be posted inside The Lounge or The Watering Hole; it will remain posted until you want to take it. $100 a stainless steel mug with leather band, imprinted with the Saddle Up! logo. 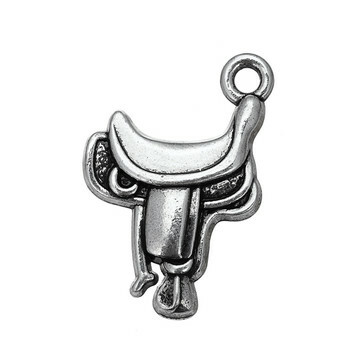 $175 a metal necklace pendant of a saddle, in honor of our design. 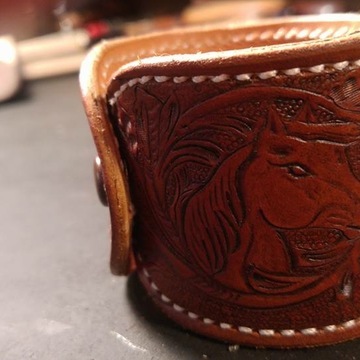 $225 a handcrafted leather bracelet with our Saddle Up! logo, created by local Cody artist Johanna Vulpius of Apple Jack Ranch. Send us an email (april@yellowstoneburners.org) if you have any questions. 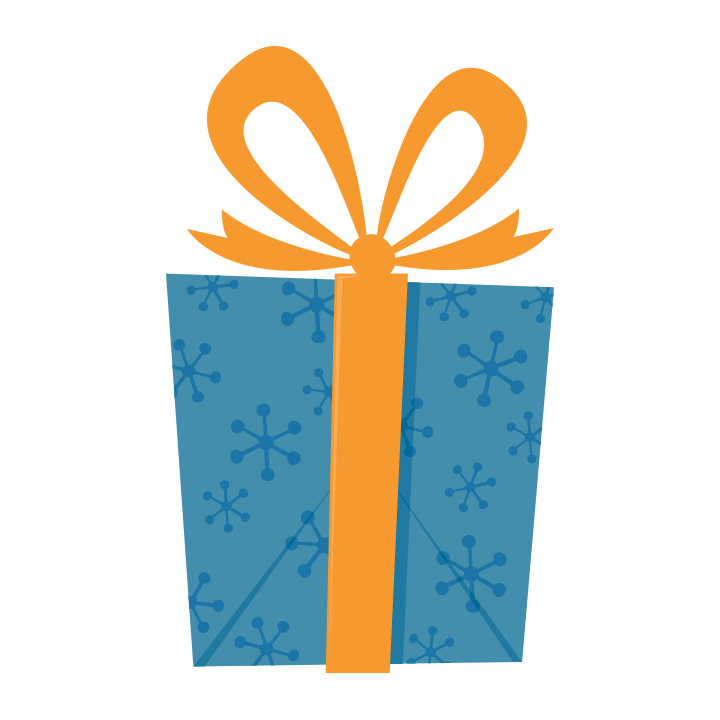 We're happy to ship your items or you can find Saddle Up! on playa and we'll have your perks on board. Thank you so very much for your support! Yellowstone Burners hasn't posted any updates yet. This handcrafted wide leather bracelet will be created by local Cody artist Johanna Vulpius of Apple Jack Ranch. Each one will be slightly different as they will be hand created and will feature the Saddle Up! logo. Jo and her husband Bounty were part of the inspiration for the art car <3. Check them out at http://applejackranch.com/. A high quality vinyl sticker with our Saddle Up! logo. We'll create a custom bandanna with our Saddle Up! logo, perfect for windy days on the playa. 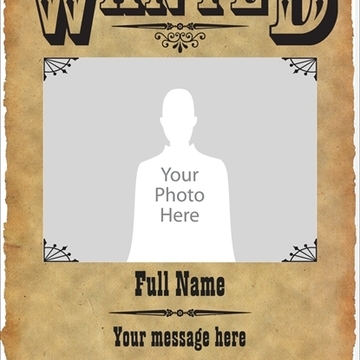 Send us your photo and we'll put you on a wanted poster! We'll hang the poster on Saddle Up! either in The Lounge or The Watering Hole. You can leave it with us or pick it up on playa and take it home when you're ready. 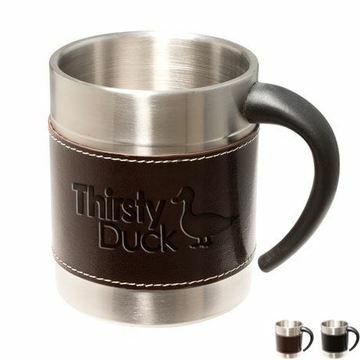 Keep your water, coffee, or fire water in this sturdy stainless steel mug with a leather band, stamped with the Saddle Up! logo. Handy on and off playa. This metal saddle pendant is the perfect representation of our little project. By wearing this, you'll be instantly recognized for your support of Saddle Up! Yellowstone Burners is managing the funds for this campaign.